Yesterday, Google announced they have acquired Zagat, one of the most trusted and respected local reviews sources out there - and have been for years before the internet. Their surveys may be one of the earliest forms of UGC (user-generated content)—gathering restaurant recommendations from friends, computing and distributing ratings before the Internet as we know it today even existed. Their iconic pocket-sized guides with paragraphs summarizing and "snippeting" sentiment were "mobile" before "mobile" involved electronics. 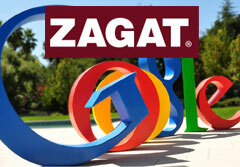 Google will be bringing Zagat's content, knowledge and experience to Google search and Google Maps in the future. How so exactly, that remains to be seen. There is currently a lot of debate on the future implementation and the focus of Google on this acquisition.